Designed for Success! Every decision made in your Spa is intended to create success: profitability and competitiveness for the spa, great experiences for your clients, sustainability for the spa, your staff and our planet. Successful decisions take the breadth of your experience combined with the experience of many others. Your equipment manufacturers can and should be an important part of your team. The first step is to choose the right manufacturer, one with a solid reputation and experience in designing and building products for spas. One whose product engineering ensures longevity, ease of repair, ergonomics and client comfort will serve you best. The initial purchase price may be higher, but their success is proof of long term value and return on investment. Look for companies that have won awards in the market place and can provide references from other successful spas. Don't forget to look for the company's commitment to the environment. Do they offer FSC (Forest Stewardship Council) products, CFC free foams, non-vinyl upholstery fabrics? Companies committed to doing their best most likely produce the greenest products: products that are designed to last. When you are making such a purchase, you’ll want one that satisfies all of the needs of the people who experience it: client, therapist, spa owner, and even the maintenance team. Let’s consider the priorities and all the points of view. The client is the center of all things, your major focus. Comfort is paramount, safety in mounting and dismounting the table, sense of security, serene and harmonious service, and appealing aesthetics are the major concerns. Great padding ensures both comfort for the client and good access for the therapist. This is starting to change, with 4" and even 6" high quality padding options available. The thickness itself is only one criterion. Is it supportive and resilient enough to eliminate pressure on sensitive breasts and bony areas? Does it hinder or aid the therapist’s work under the client’s back? Is it durable? Good quality padding is expensive, but it is an investment with great rewards. Look for longer guarantees on foam and fabric that support quality claims. High-density polyurethane foam that is California 117 certified, CFC-free is the best choice for longevity, comfort, accessibility and ecological responsibility. Sinus pressure and congestion can ruin an otherwise great experience, so the face rest is very important. Memory foam has its place in this application, and more advanced systems that incorporate water spheres inside of the foam to disperse the pressure have emerged. Platforms that can be widely adjusted to accommodate all the shapes clients come in can go a long way to alleviate discomfort. Good therapists make the difference between a successful spa with loyal, repeat customers and one that is constantly rebuilding its customer base. Therapists have a physically challenging job. An electric lift table allows therapists of different sizes to walk into any room and quickly adjust it for their height and style of work to ensure good ergonomics, essential for workplace safety and productivity. Allowing change in height during the session enables the therapist to sit, stand, and apply appropriate pressure for any size client without strain. The on-command height adjustments also allow customization of treatments based on client expectations and feedback during a session. A relaxation massage can become a cranio-sacral session or a deep tissue massage with ease. An electric lift table also allows each client to get on and off the table safely. The size of the table from every point of view is also important. As all of us know, good ergonomics require a minimum of twisting and reaching when exerting force, and the wider the table, the more a therapist has to strain. Generally any table over 29" wide is going to create challenges for some of your shorter therapists. An electric lift table with on-command height changes helps. With this feature, most therapists can work safely on 31" wide tables, which happen to be a size that 90% of clients find comfortable. Wider tables might be more comfortable for large clients and 32" and even 33" wide tables are available but not recommended. For larger clients the use of armrests and table length extenders is the best solution. The length is not as important, and 72" long is both typical and functional. The therapists will likely need ready access to hot towels, hot stones, and positioning devices such as bolsters and the most beautiful tables have convenient, well-designed cabinets. For small rooms this is a great feature. However, some items would be better located in either a trolley or a built-in cabinet system. The goal: convenience for the therapist and a great aesthetic statement to the client. While taking care of the client is key to any decision, ensuring that both clients and staff are satisfied ultimately delivers bottom line profitability. Initial cash outlay and cost per session are big drivers in the decision process also. The old adage still holds true, you usually get what you pay for. Better equipment may cost more money, but it delivers a lower cost per session and higher customer satisfaction leading to higher volumes of business. Some quick math: If you buy a table that costs $4,000 and it lasts 10 years, with an average of 3 treatments a day x 365 days a year, it will cost about 50 cents per treatment including maintenance. Obviously, higher utilization of your rooms is common and this is very conservative analysis. Flexibility and versatility are key in optimizing room use to insure profitability. Therefore, it makes sense that products designed to do a wide range of services are best, as long as they don't compromise on the core purpose. For this reason getting a table that has a salon or "flex" top ensures that the room can be used for many types of treatments. Wheels are also a good idea, allowing easy movement of the table within the room to accommodate facial or other equipment or to even move the table to another location. Electric lift tables ensure that every therapist can work more comfortably and this really helps keep turnover down. 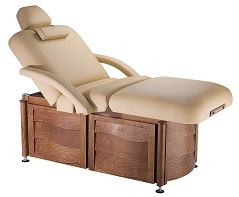 The ultimate in flexibility is found in a table that features a concealed, but fully-plumbed, jetted foot bath with drain that can function as a massage table or multifunction salon top for every conceivable treatment. When the cost of real estate is taken into consideration, these ultra-flexible models allow spas to handle more treatments in a smaller footprint at a lower total cost. The best companies deliver on their brand promise. A company that has designed a high quality product typically is one where customer service is not a big cost to them and therefore the service level you receive will be high. The table will be designed to have parts easily replaced, easily serviced, with quick response. Otherwise, the cost of repair can run into big money, both in actual cost and in time lost. Last, but not least, is aesthetics. For a high-end spa where finishes cost a bundle and are key to your brand, it is important that the look of the equipment match your decor. Some companies go beyond just offering a selection of looks and finishes, and offer a level of customization that includes matching stains and even wood and trim elements. That being said, customizing should only be considered when you are sure that your idea will work and the manufacturer can effectively implement it. Be prepared to find out that your idea is either not cost effective or not really workable. Perhaps a combination of elements already offered by the company might meet your needs just as well. If at all possible, experiencing the product before purchase is the best, and these days that likely means attending a major trade show or finding an experienced and reliable dealer who has product available at a show room. The goal is to design for success, so always keep all the people involved in the use of the product in mind and choose a company that can guide you to a product that will help you be successful. The manufacturer’s success is contingent on your success.